Supervac High Expansion Foam Generator, Fan Dia < 16"
The High Expansion Foam Generator is capable of producing foam up to an expansion rate of 1000:1 for tough extinguishments including flammable liquids mining operations, and ship hold areas. It attaches easily to any Super Vac smoke ejector. 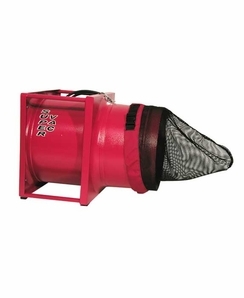 • Includes a 30 GPM inline educator, metal shroud, and foam expansion netting. • Can be ordered in either red or blue. Product Reviews for Supervac High Expansion Foam Generator, Fan Dia < 16"